The following article explains how you can travel to different cities in Cyprus from Larnaca airport using public transport buses. To travel using public transport buses from Larnaca airport to other cities in Cyprus may involve catching a bus from the airport to Larnaca city and then changing at Finikoudes bus stop for an intercity bus to the final destination. For Limassol and Nicosia there are also shuttle services that can be used to travel from the airport direct to Limassol or Nicosia. For public transport buses, excluding the shuttle services, there are frequent schedules to use during the day but please be aware that services are less frequent in the evening and no services will be available during night hours. The bus stop at Larnaca airport is found just outside the airport building. There are signs as soon as you leave the baggage claim areas which guide you to the bus stop. Currently there are two shuttle services available. A shuttle service to Limassol and a shuttle service to Nicosia. The following buses are available from the airport and all can be used to travel to Larnaca City. All these buses will stop at Finikoudes. Buses to other destinations in Larnaca are available from Dimitras Main Station. Seats cannot be booked in advance and tickets can be bought from the bus driver before using any service. For information about the cost of using these services see the bus fares section. To check availability of buses to any destination click on the links provided above and view the timetable for each of these bus services. If travelling in a group you can hire a minibus or a coach for this transfer. 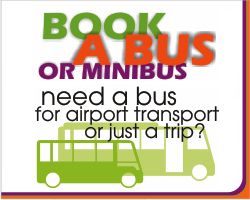 For more details check our minibus or coach hire services.